View the Labels/SDS information for Caravan G Insecticide. Caravan® G insecticide/fungicide is a broad-spectrum combination product delivering the disease control of Heritage® G fungicide and the insect control of Meridian® 25WG insecticide. Depending on application timing and geography, one application of Caravan G made between mid-June through mid-July can yield season-long grub control and up to one month preventive brown patch control. For additional disease control, follow-up applications can be made with Heritage G or Headway® G fungicides as needed. Caravan G provides systemic control of pests and disease on turfgrass including residential, commercial, golf courses and athletic fields. Easy-to-close bag reduces waste from spills, allows the use of only what is needed for each treatment. Multi-purpose product to be carried on every service vehicle. 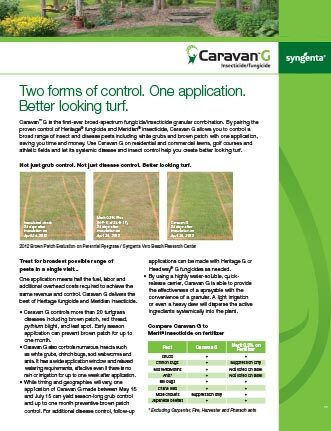 An overview of Caravan G insecticide / fungicide for disease and insect control in lawns. Caravan® G, Greencast® is a trademark of a Syngenta Group Company. Heritage®, Meridian® and Headway® are trademarks of a Syngenta Group Company.